Elevated between 3789 ft and 10171 ft, the Ski Resort is among the 10 highest elevated Ski Resorts in Italy. The vertical drop from summit to base is 6381 ft. The average difference in altitude between base and summit of Ski Resorts in Italy is 3087 ft. Most runs are therefore relatively long. Ponte di Legno - Tonale - Temù (Adamello Ski) is among the 3 best rated Ski Resorts in Lombardy. Season starts on Nov 10 and ends on May 1 (172 days). Average season duration in Italy is 130 days. Average snow depth during the season (Nov 10 to May 1) is 53 " at summit elevation and 28 " at base elevation. Snow coverage is usually best during March, offering an average snow depth of 74 " at summit elevation and 40 " at the base. Therefore Ponte di Legno - Tonale - Temù (Adamello Ski) is among the 5 ski Resorts with best snow conditions in Italy. Ponte di Legno - Tonale - Temù (Adamello Ski) features 101 sunny days on average per season. The average for all ski Resorts in Italy is 89 sunny days. April is the sunniest month with an average of 22 sunny days. This makes the ski resort one of the 10 sunniest in Lombardy. Offering 39 miles of slopes and terrain, Ponte di Legno - Tonale - Temù (Adamello Ski) is among the 3 largest Ski Resorts in Lombardy. Situated at the border of Trentino and Lombardy, Passo tonale is a natural amphitheatre that marks the border between Val di Sole and Vallecamonica. Passo Tonale is part of the Adamello Ski resort which offers you 100 km of slopes. Its altitude spans from 1155 to 3100 meters and therefore offers a breathtaking view on the region´s sunny side. The slopes at Passo Tonale are suitable for beginners as well as for experts. 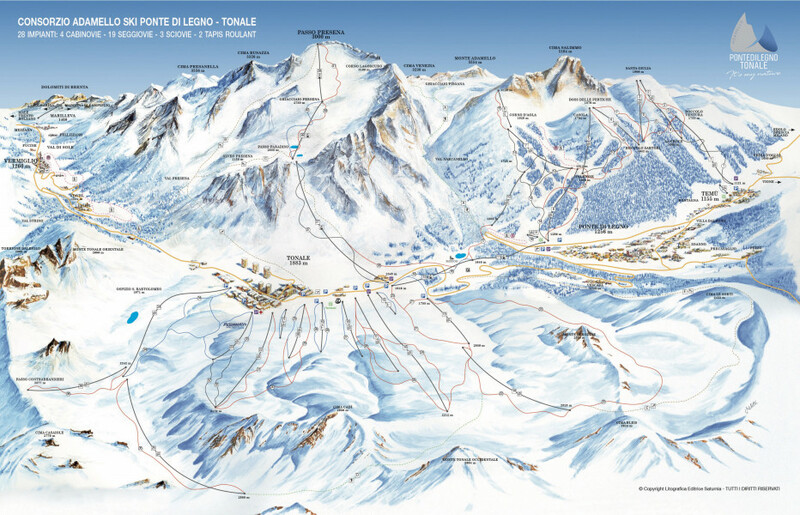 Passo Tonale´s slopes are interconnected with the slopes at Ponte di Legno ski resort and hence with those at Temù ski resort. Freestyle fans enjoy the Snowpark Tonale. It is located next to the Valena chairlift and offers obstacles for beginners as well as for experts. There is also a snowcross slope. Children feel at home in the kids area. Magic carpets, tobogganing and snow tubing tracks ensure lots of fun in the snow.